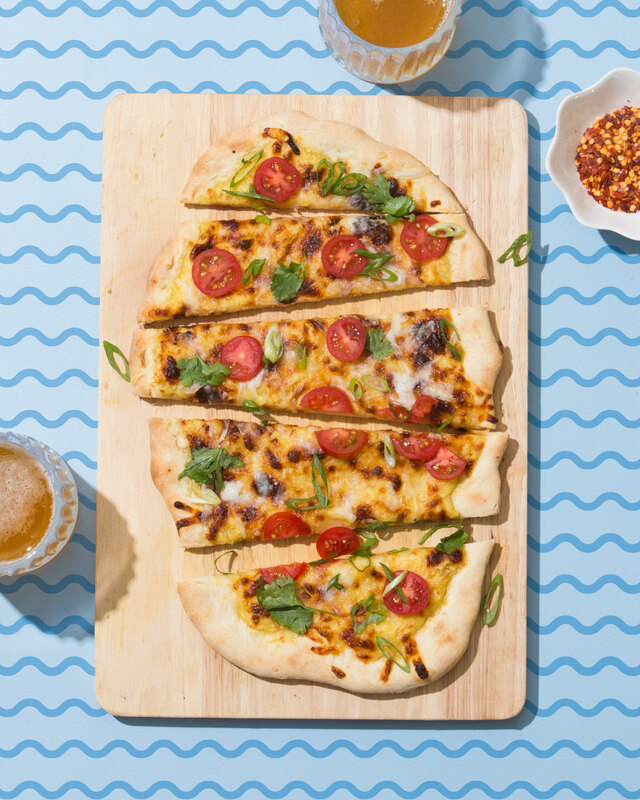 This recipe is exactly what it sounds like if it sounds like we’re using blended up corn instead of a tomato sauce and it’s genius (all thanks to my v cool friend Izy Hossack, of top with cinnamon fame). 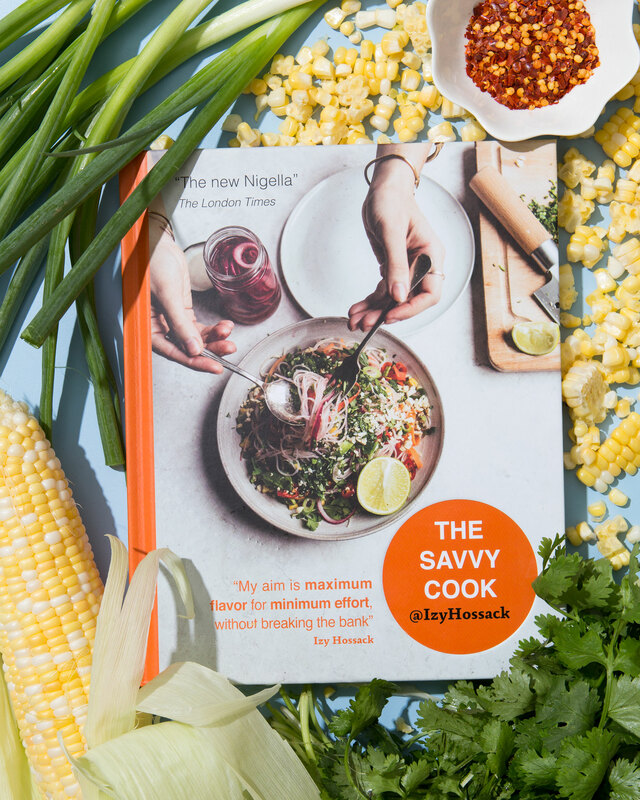 Her book The Savvy Cook came out last month and it’s full of of just really good, simple dishes that anyone can make. Everything has limited ingredients, there’s a helpful section with each recipe to help use up any leftovers you might have, and it’s all vegetarian. * But very filling vegetarian because that’s Izy’s magical talent. 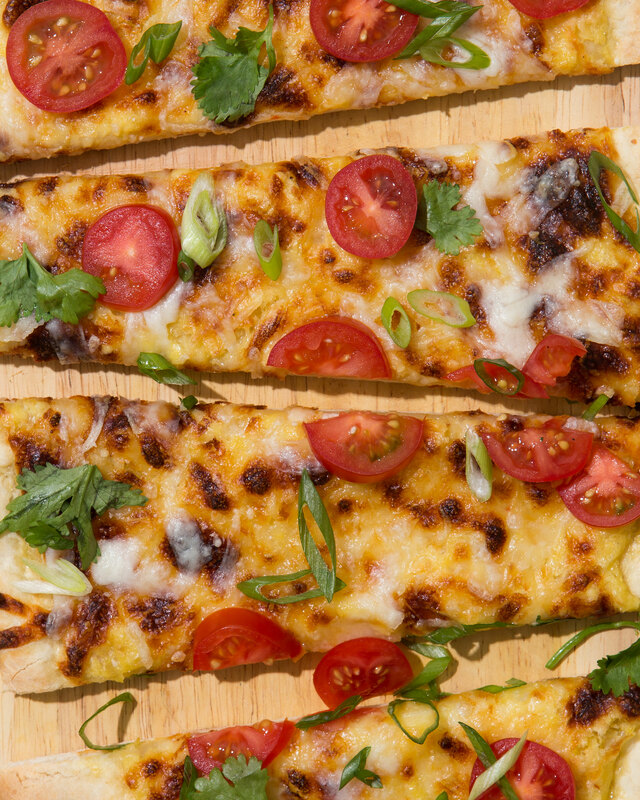 The corn on the pizza though is so so smart and perfect for all the corn in the grocery stores right now. It plays just like a tomato sauce with a little bit more of a creamy texture. To make sure it’s not too sweet, because corn is perfect right now, we just add some salt and a pinch of red pepper flakes and it’s perfection. 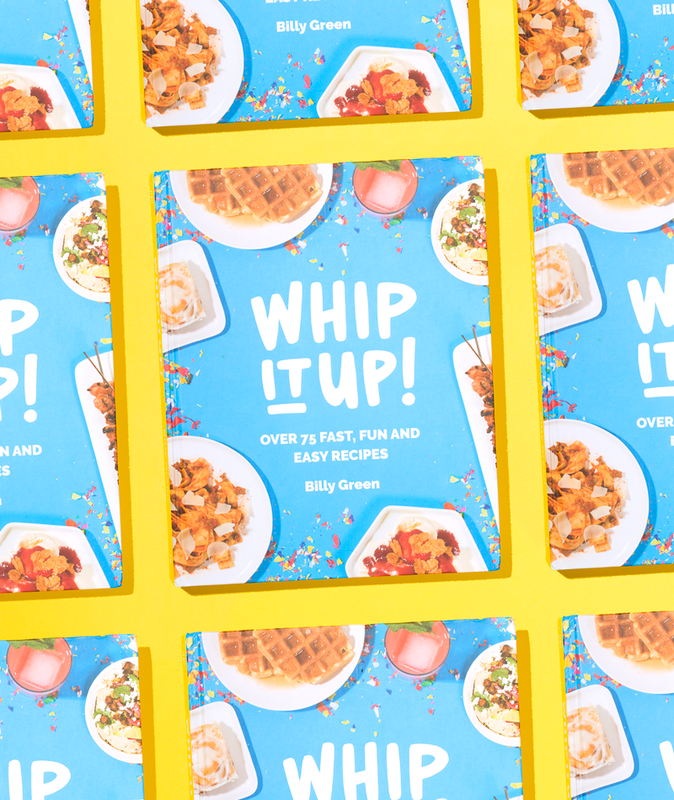 If you’re looking for a good cookbook with simple filling recipes go buy Izy’s Book. RIIIIGHT NOWW. Hello Hi Happy Tuesday I brought you the thing that everybody loves on instagram during the summer: S’mores. 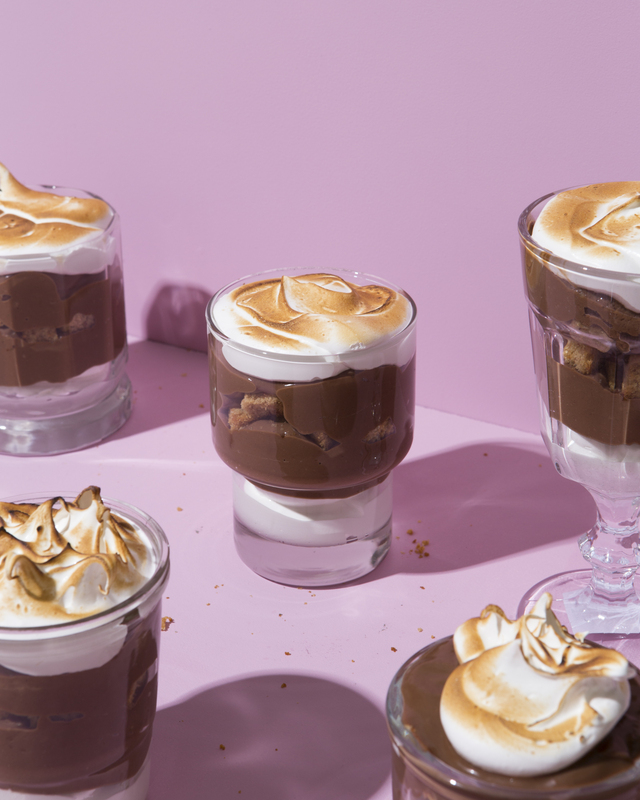 But because I’m just as extra as I am basic I went and put together a whole trifle situation that involves cake, pudding, and marshmallow fluff. Wonderteam extra powers activate. I’ve actually wanted to make a honey graham cake for a while now so I could have some sort of alternative to the classic cracker in desserts or to use with fruits during the summer and then it just happened that Bob’s Red Mill wanted to collaborate on something and praise be, the Brown Butter Honey Graham Cake was born. There were actually several no-go’s before the final cake had happened. It’s tricky baking with whole wheat flour and not getting a super crumbly end result but luckily the honey helps out with that a little, but there’s still a lesser amount of the graham flour that could be used than all-purpose to give us a nice crumb. After a few failed loaves I landed on the idea of melting the butter to give it more of a pound cake consistency and less of a cakey consistency then went one step further by browning the butter. Usually with brown butter you need to use more so you don’t lose the moisture but that honey came in and swept me off my feet yet again which was great because that nutty flavor you get from browned butter works magic and gives you even more of that classic graham cracker flavor profile. I think the cake by itself is fantastic, I really do (I’d eat it with half a jar of peanut butter if it wasn’t socially unacceptable) and it’s perfect for all the summer produce that might need a hearty pairing but there’s something magical about combining it with a rich pudding and meringue faux fluff that makes me happy I have another vehicle for s’mores flavor consumption. Special shout out to Bob’s Red Mill for sponsoring this post and helping keep this site/me moving/shaking/grooving. I’m currently up in the air headed to Seattle with no wi-fi so with no google so I’m just going to assume that somebody else out there figured this out years ago, bless them they are a savior. 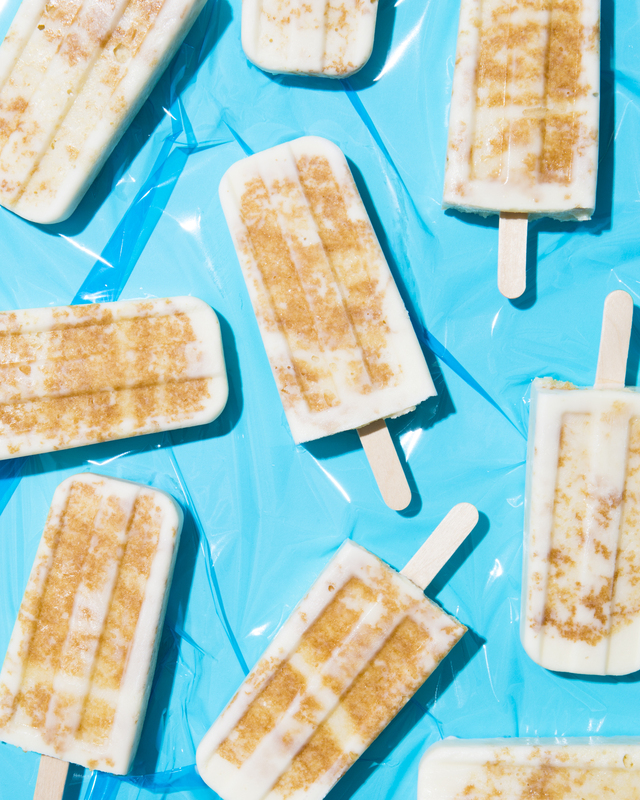 Last year I messed with these cobbler pops for popsicle week that I very much still love enough to maybe get a cobbler pop tramp stamp? but that’s still a maybe. I think my favorite part of all of it surprising* was the chunks of cakey cobbler topping that sort of get chewy in the freezer. *Should not be surprising actually because I prefer all forms of cake very cold like a beautiful weirdo. 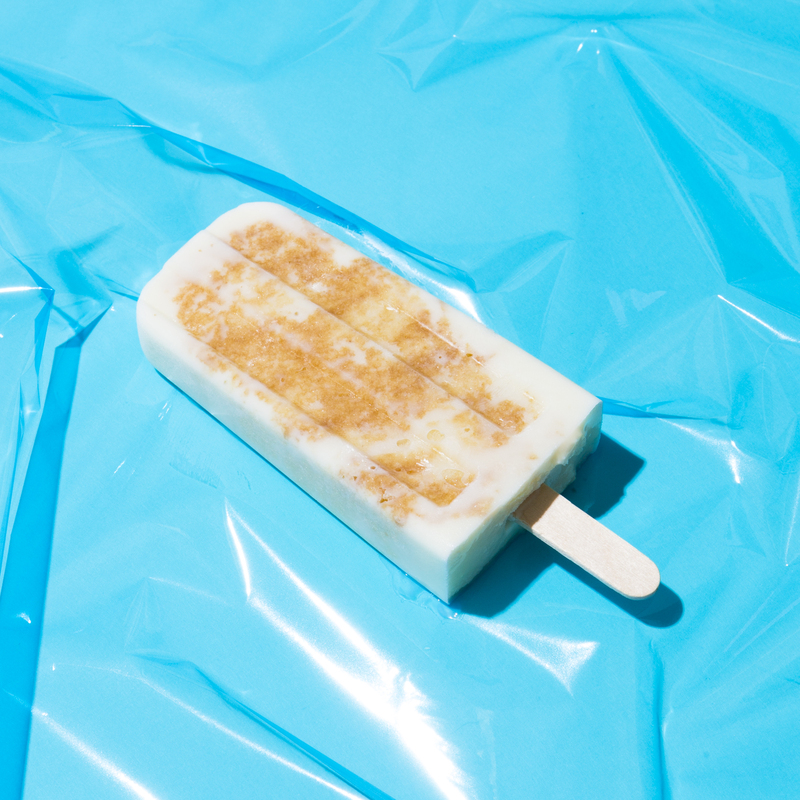 The way we’re kind of changing things up from last year is that this is literally a slice of cake shoved into a popsicle mold and doused with the tres leches mixture that is very beautiful and something I could probably just drink on it’s own. The whole cake sort of soaks up the liquid and creates something very similar to the regular tres leches but just, frozen. 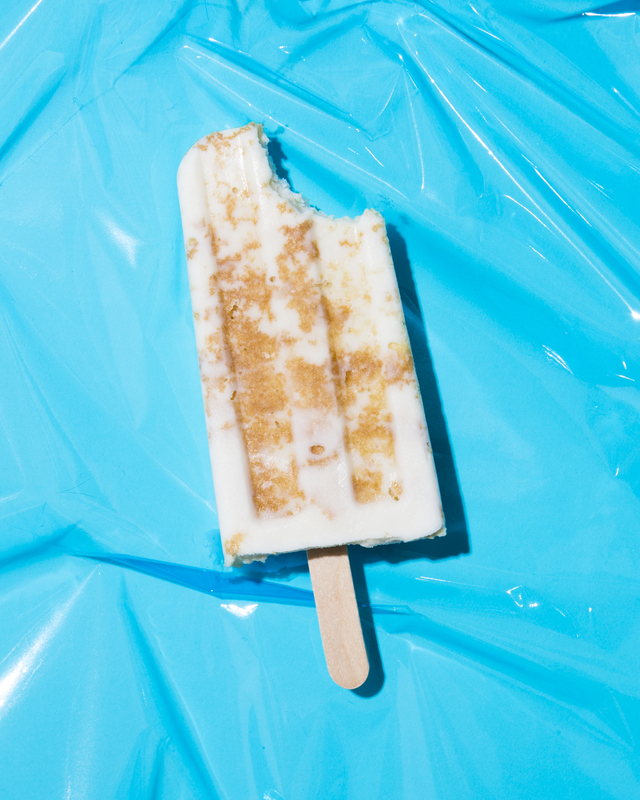 It’s perfect for the summer and the cake itself is way easier than the traditional sponge, the only little bit of bob the builder cosplay is the construction and building of the popsicles but I promise it’s 100% worth it. It’s heeeeeeere!! Popsicle week 2017 extravaganza year 5 house down boots. And every year it just keeps getting bigger and stronger and now even prettier. 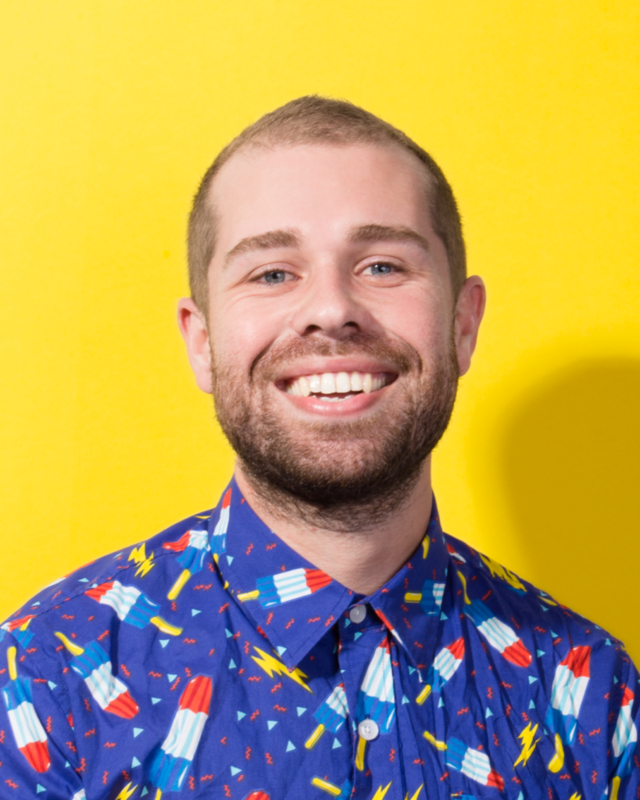 The Popsicle Week page got a nice nip tuck/slight injection and he looks better than ever. Nowwww starting with this year you can actually see the images of all the pops and sort through them by the type or a dietary restriction you might have. It’s 2017! And just like all the years prior you can keep up with the popsicle week page on the actual page but you can also just search around all the social medias with the #popsicleweek. Another new thing happening this year is that I was in Allrecipes Magazine talking up the whole week! There’s a spread in there with some really good popsicles and all the tips and tricks that would require loose flowy sleeves to hide. 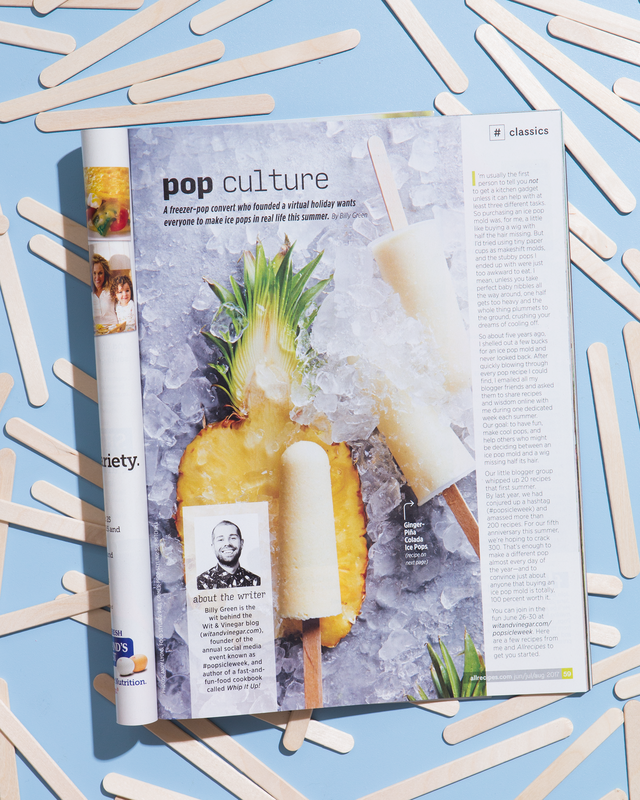 And as if that weren’t enough I’m going to be up in Seattle but also on their facebook page this wednesday at 2pm pst talking up popsicles and why I love them and why I love this week. We’re going to making some blueberry cobbler pops from last year and maybe gossiping about freezers and popsicle molds. Speaking of which, I finally put together some of my favorites for popsicle molds because in the 4 years I’ve done this it took year 5 to really get me there. I know molds can be an investment (one of the main reasons popsicle week happens so you’ve got a resource) but the good news is that there are some affordable options out there. Also disclaimer this is not in any way sponsored but these are all affiliate links so I get a small kickback. Buuuut the good news is you can google search and buy these wherever your heart desires. 1. CHICHIC Set of 6 DIY Popsicle Molds – these are actually brand new to me, introduced by whoever found them at Allrecipes for the spread, but I love their size and shape, perfect for kids, aaaand there’s a cap that can help hold the stick in there along with the plastic sticks so you can choose and aren’t forced to use a flimsy plastic stick. The only con is that there are a lot of pieces but I just keep them in a gallon ziptop bag and everything’s good. 2. Norpro Frozen Ice Pop Maker – This mold’s probably my favorite of all favorites (don’t tell the others) but most of the popsicles are made and tested using this one. It’s held up extremely well through several years of popsicle week and a couple moves. There’s another brand that has the metal lid but I actually prefer the plastic because it tends to not stick to any of the popsicles if they freeze over and it’s more flexible when removing. 3. 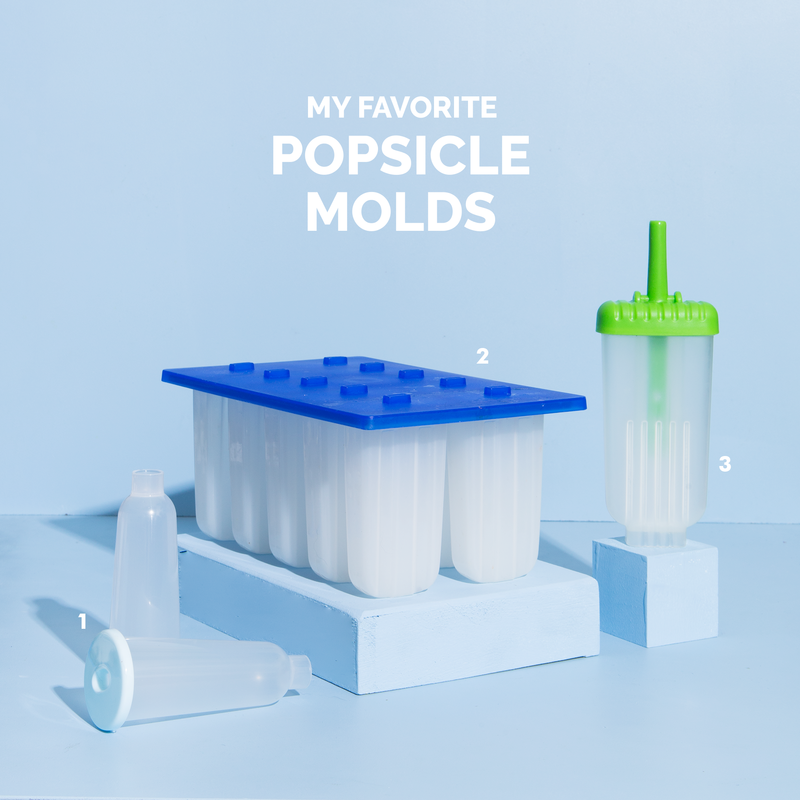 Tovolo Groovy Ice Pop Molds – These are my favorite for just leftover smoothie or whatever option. They’re a little bigger (4oz vs the 3oz norpro molds) but there’s a base that holds them all in there where I can easily remove one if I want to or just use one if I have some extra something that I want to freeze or experiment with. 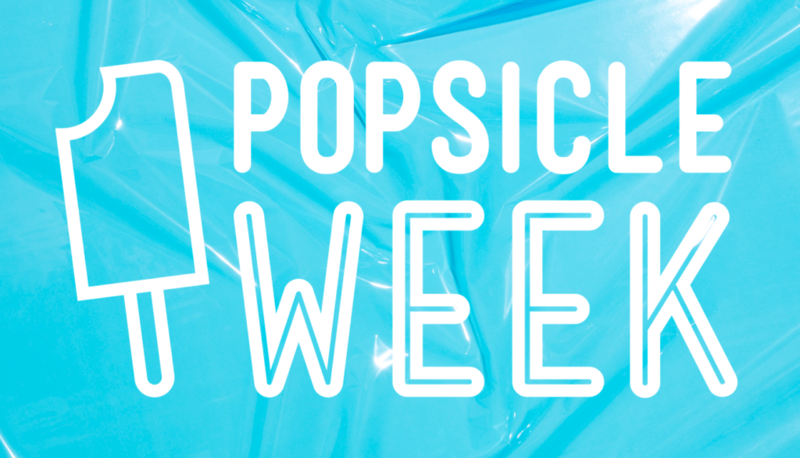 That’s about it for this year, keep your eyes on the page/prize and show everyone what you’re making with the #popsicleweek! I guess it’s officially s’mores season even though a. it’s a million degrees right now and b. any season can be s’mores season if you believe it enough in your heart. I actually make any season s’mores season by going the broiler s’mores route: just line up the crackers and chocolate and marshmallow stacks and broil away. No campfire involved, probably no pants, and a whole tray of s’mores to myself. 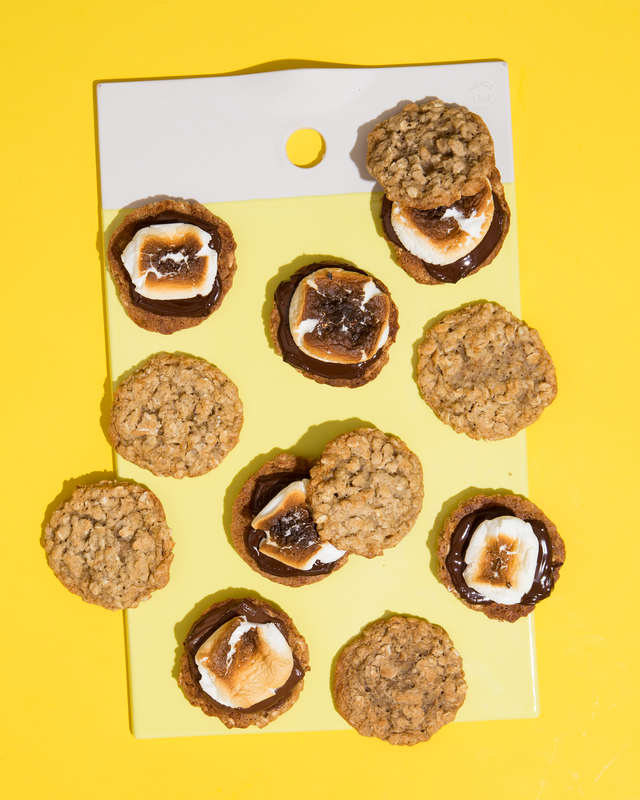 And then I went and took these s’mores to the next level by taking the graham cracker out of the equation and putting banana oatmeal cookies in their place. Banana oatmeal cookies are exactly what they sound like: oatmeal cookies with mashed bananas in them and the flavor we get is something very similar to a dried banana chip with addition of toasty oats and I am living because they give me life. 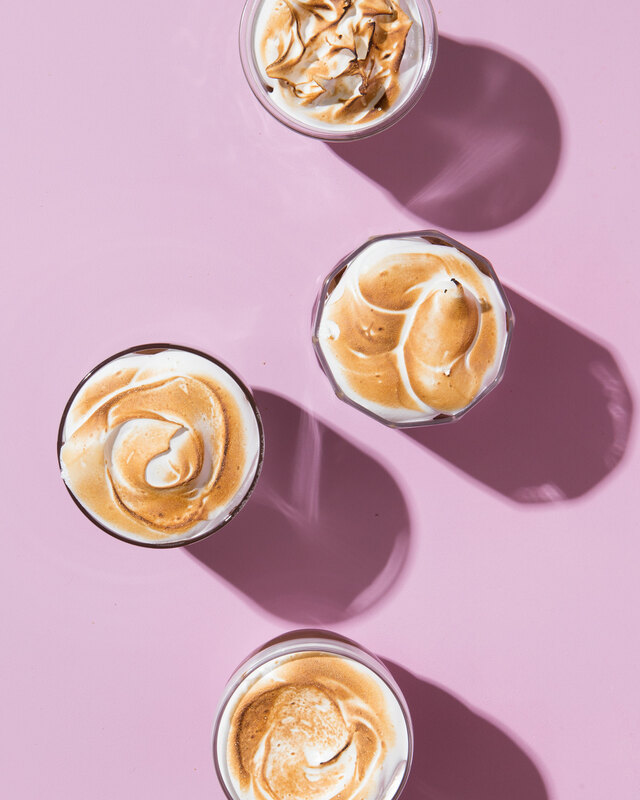 They give me sort of oatmeal cream pie vibes (of the little debbie variety) with a chunkier build, think me in a sweater, which means that yes my head has already gone in the direction of banana oatmeal cream pies and we’ll be discussing this at some point later this summer. 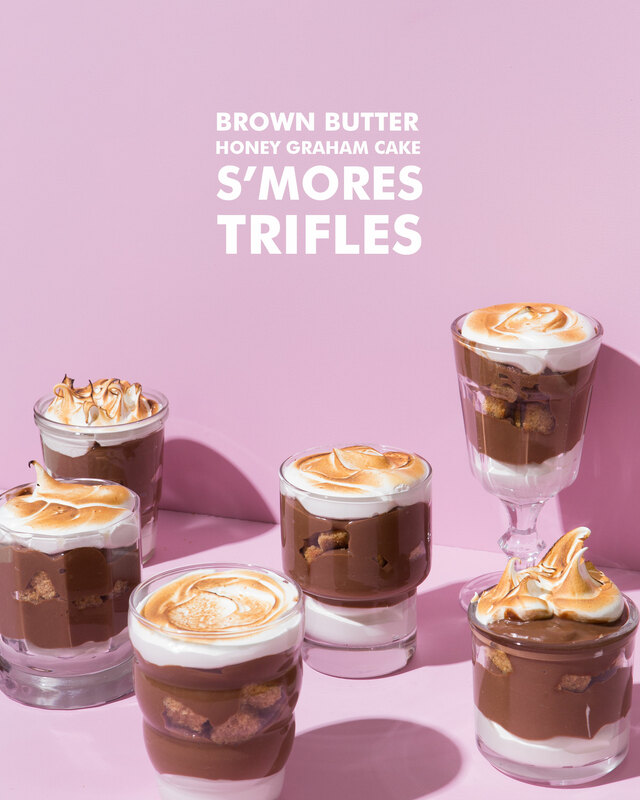 For this Post I teamed up with Revol, creator of some fiiiine cookware and bakeware, to serve and showcase the s’mores. We’re playing with their porcelain Color Lab collection today because if there’s anything more on brand for me I’d like to know about it. 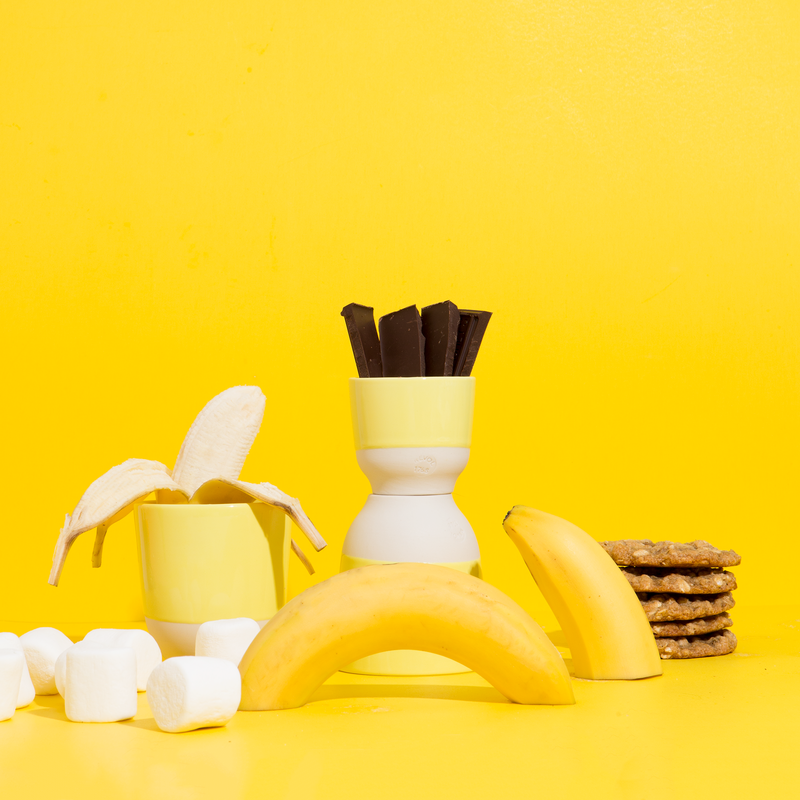 I went with all the yellow options because branding and also I knew I wanted to make something with bananas for whatever reason you want to think up in your head. 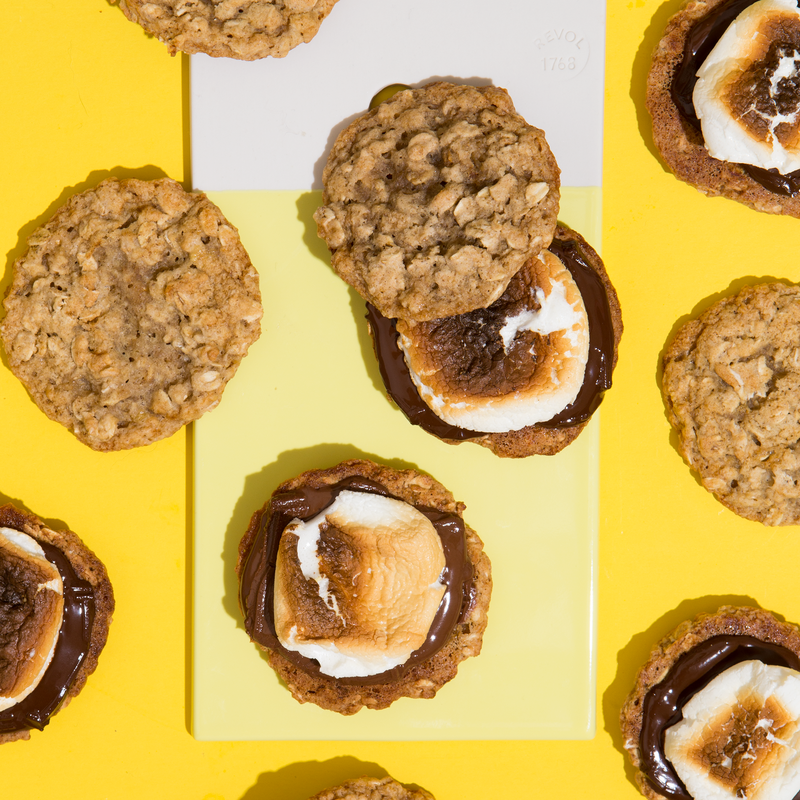 I highly suggest you make a batch of these for your next bbq/gathering/night in alone watching netflix because everyone loves s’mores and they cookies are far superior to the graham cracker with their soft chewy glory. Hi Hello Happy Mother’s Day Weekend here’s some boy bait for ur mom in case she wants a man. Or a woman, if she’s on our lgbtq train, we can call it girl bait too because girl, you’d like this too. Which makes sense that we’re making it for mom! I’m not able to be with my mom or my sister this mother’s day because they’re so far north but I did send my mom a bouquet of flowers at work. I know this will a) make her v happy and b) brag about her children to everyone at work even more. My mom is one of the most humble people I’ve ever met but trust and believe she’d brag about me getting 30% off a couch if she thought it was a big deal. This is why she got the dedication in my book. When I was visiting and testing recipes a trip to the grocery store would take twice as long because she introduced me as her son that was writing a cookbook to every person she knew because she was my Mendocino county PR team. Of course the addition of her being the best, most supportive mom was the icing on the dedication cake gig. 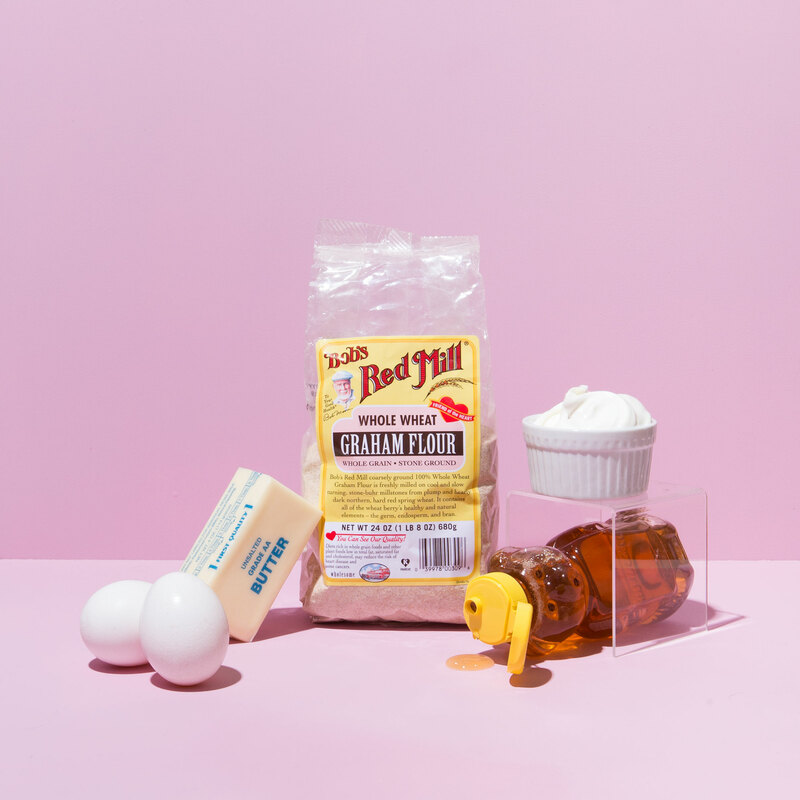 I’m in love with the idea of boy bait because it’s a simple not too sweet option for breakfast, brunch, or dessert, and it takes all of about 10 minutes to throw together and toss in the oven. 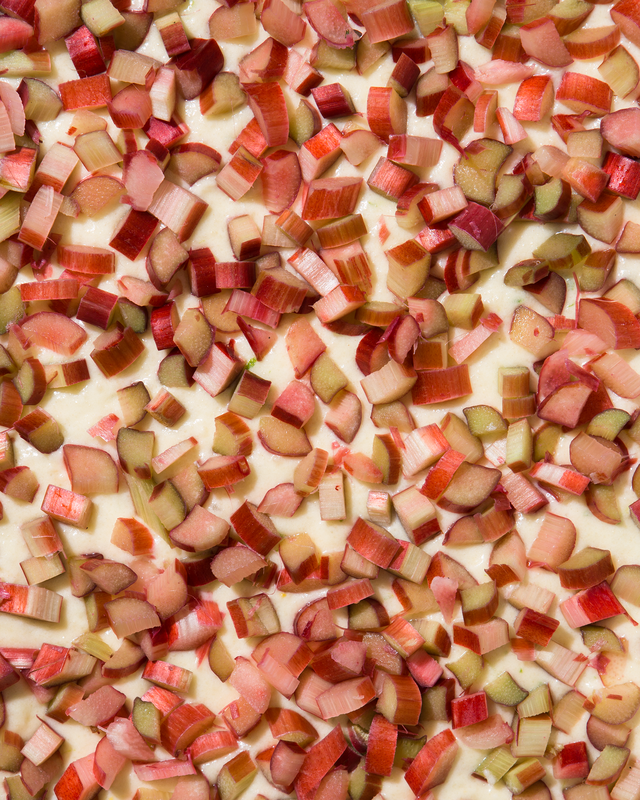 The usual, original flavor of the boy bait is blueberries, which I’m sure would be equally as delicious, but I went with my favorite spring combo: rhubarb and lime. 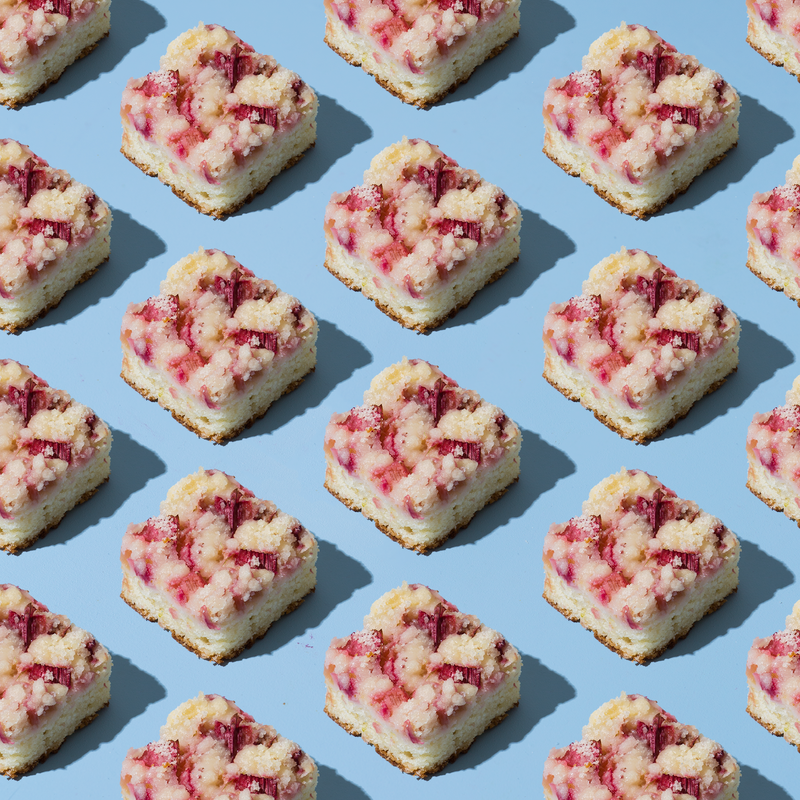 These are actually very similar to my pie bars that I’ve made countless times but the base here is more cake/breakfast friendly instead of the shortbread situation so you can serve it whenever wherever Shakira wants to eat this on Mother’s Day or really any day you’ve got fruit to use up and eating it by the handfuls isn’t in the cards.